I find that Assassin's Creed books are generally quite good. 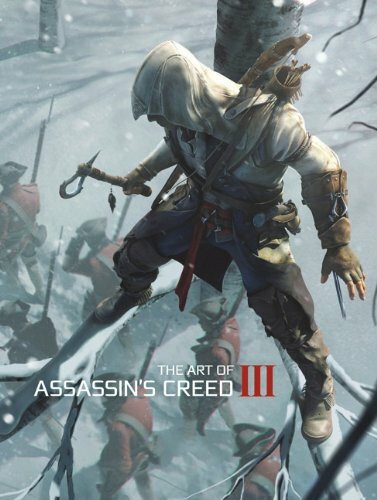 It's not just artbooks, the game guides too, and of course the wonderful Assassin's Creed Encyclopedia which is now updated to 384 pages for Assassin's Creed 3 (AC3 Encyclopedia Edition | Ubi Workshop). The Art of Assassin's Creed is a 144-page hardcover artbook in rather similar size to the first artbook Assassin's Creed Limited Edition Art Book. This time, the game travels back in time to the American Revolution from 1753 to 1783. As such, you'll see a lot of period costume designs, so much that I think fashion design probably flourished at that time. Most of the character designs are of soldiers and generals in uniform. The environment art consist of a small portion on present day and the rest are in the past. You can really see how the mood is set by colours and lighting. Abstergo offices look rather sterile with the hard edges and the Temple is more stylized without going into much details. Environments for the past look bleak. It's like the sky is overcast every day, regardless of whether you're in the forest, town or at sea. I noticed that many paintings have a tendency with subjects blending into the dark shadows. Like if Connor Kenway is perched atop a structure with his face lit, the unlit part of the body will just merge with the unidentifiable structure. That's the soft edges technique in art. In this case, I guess it's to emphasis something about camouflaging, and to keep you wondering what's lurking in the shadows. There's not a lot on weapons. The main bulk of art are on characters and the environments. Commentary comes with all the illustrations and they talk about the art and setting. The art is great but the subjects and artistic style might not appeal to some people. I spoke to a friend and he said he preferred the art for the earlier games. I also felt that way to a certain extent. I did a review as well, AC3 wasnt my favorite. (My fav is brotherhood) And the book is kind of lacking. Thanks for the pics! AC3 was my most fave game so far! Best Assassin's Creed ever. Definitely a must buy for me.